Moodle provides the ability for instructors to export and download forum posts which can be helpful to save students' contributions. 1. Add the Export Forum block, if you do not already have it. 2. Click the Export Forum link within the block. 3. 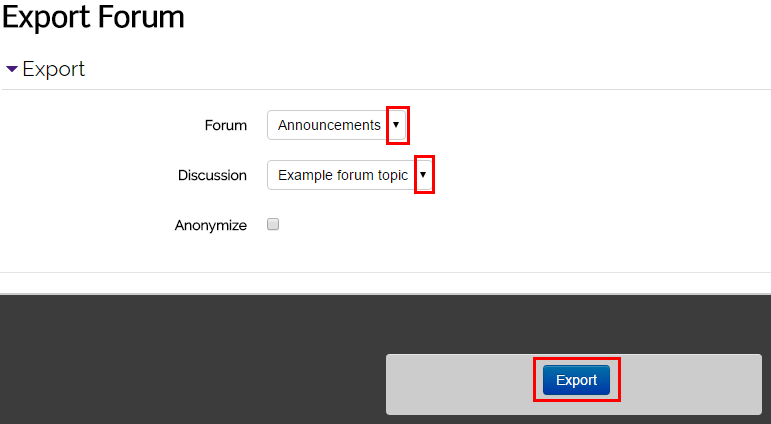 Select the Forum to export from the drop-down menu. 5. If you want posts to be anonymous, select the Anonymize checkbox. If this option is chosen, students will be referenced by a number, not their name. 6. Click the Export button at the bottom center of the page. 1. Log into Moodle and click on the course. 2. Click the Edit button, located in the upper right of your screen on your course front page. 3. Find the Add a Block block. Select Export Forum from the drop-down menu.